You are here: Home > News > EHOD Heritage Heroes 2016! From the many places open to visitors for this year’s European Heritage Open Days, five buildings have been chosen to demonstrate the great work being done to protect built heritage in Northern Ireland. Why not visit this weekend for EHOD, 10th-11th September 2016. “Heritage Heroes” highlights the hard work of voluntary groups and individuals who have made a real difference to our built heritage. It acknowledges some recently completed projects and those that are progressing towards being achieved. 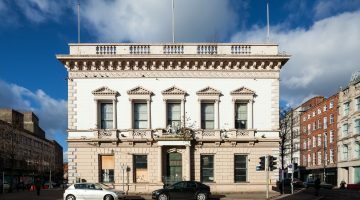 PORTICO, Portaferry and Bishop’s Gate Hotel, Derry, are recently restored listed buildings which have found new cultural and tourism uses and are up and running. Have a look around Old Park Carnegie Library, Belfast, and learn about the exciting plans for its future restoration. Dan Winter’s House, Loughhall, demonstrates the owners’ commitment to maintenance, repair and development of a traditional rural dwelling and collection of local history artefacts and displays. Visit the expert volunteer guides at Grey Point Fort, Belfast Lough, one of the best preserved early 20th century coastal forts anywhere in the British Isles and see their unique museum of military memorabilia. It’s not just about the buildings – it is people who keep historic places going, looking after them and bringing their stories to life. This is just some of the great heritage work that has been taking place in Northern Ireland over the last year – congratulations to all concerned.